Registration for the 2013 Season will be held January 23, 24, 30, and 31 6:00 to 8:00 pm, at the Bristol Central High School cafeteria and Jan. 26 and Feb 2 from 9 am to noon at the Bristol Boys and Girls Club. Registration Fees: $65 for T-Ball, $75 for Little League, $100 for Junior League plus raffle. Watch the Bristol Press for details. Tryouts for major league and AAA teams will be held in the Bristol Central High School gym. Age 8 & 9 AAA minors on March 11, 6:15 p.m. Majors age 9-12 on March 12, 6:15 p.m. Snow date March 14. The first day of practice for major league baseball teams is Mar. 27, weather and field conditions permitting. The first day of practice for AAA minor league baseball teams is Mar. 29, weather and field conditions permitting. Our annual fund raising canvass will be conducted at various stores throughout the Bristol community during the Easter weekend. Please support our league with your generous contributions. All managers will meet on Apr. 7 for the annual preseason training session. Included at this meeting will be a presentation by athletic trainers and safety officials as well as the league's operating manual. AA and T-Ball teams will begin practicing the week of April 8. All players should be informed of their team assignments by April 11. The first major league baseball games are scheduled for Apr. 13. Opening Day ceremonies to kick off our 64th season will be held on Saturday, Apr 27 at the Frazier Field Complex. All teams will be present for the opening activities. All major league baseball, all AAA and AA Minor teams and most T-Ball teams will play on that day. Our twelfth annual golf tournament in support of McCabe-Waters is scheduled for May. A special thanks to all those participants and sponsors who made our tournament such a great success. 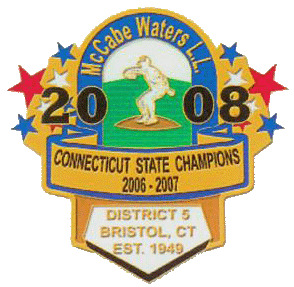 Once again the District 5 9-10 Tournament will be held at the McCabe-Waters complex during the last week of June and early July.